It’s a common belief that ceiling fans should not be used along with Air Conditioners. The reasoning given is that ceiling fans push the hot air down thus increasing the load on the air conditioners. Which to a certain extent is not wrong but what people forget is that the ceiling fans can create a breeze that makes people in the room feel cooler and more comfortable. With a ceiling fan running, you can raise the thermostat of the Air Conditioner by 2 to 4 degrees with no reduction in comfort. Increasing the temperature on the air conditioner can reduce your electricity bills significantly. 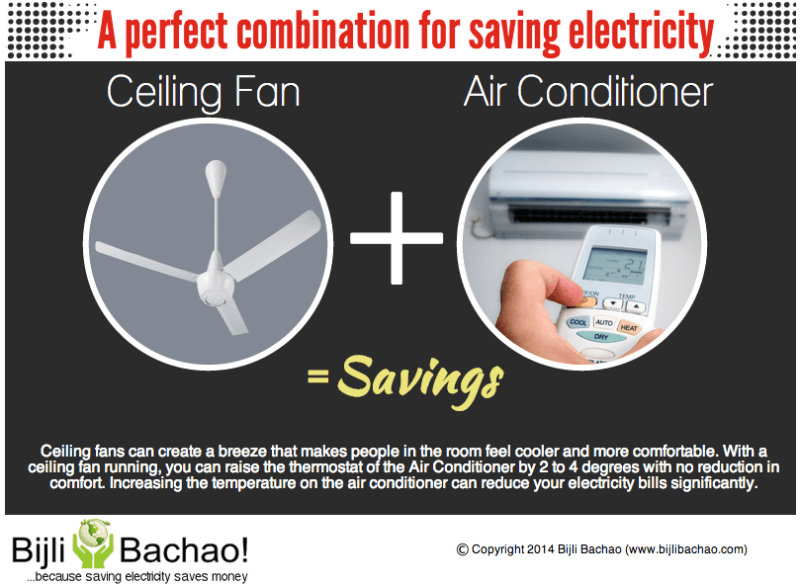 If your are someone who is worried about high electricity bills due to air conditioners, ceiling fans can be great electricity savers for you. Ceiling fans circulate the air inside the room instead of getting outside air inside the room or pushing internal air outside. They blow air downwards and remove any hot air around the objects below it. A ceiling fan does not cool the air but just moves the air around you that helps evaporation from the skin and makes you feel cool. First we measured electricity consumption of the air conditioner at 22 degree centigrade without the ceiling fan on. The air conditioner consumed 1.4 units of electricity in 1 hour (post stabilization). Then we measured electricity consumption at 26 degree centigrade with the ceiling fan on at full speed. The thermal comfort that we achieved was the same as what we got at 22 degrees without the ceiling fan switched on. The air conditioner consumed 1 unit of electricity in 1 hour (post stabilization). Then again we measured electricity consumption at 26 degree centigrade without the ceiling fan on. The air conditioner consumed 0.8 units of electricity in 1 hour (post stabilization). The electricity consumption decreases with use of ceiling fan provided the temperature of the air conditioner is increased in such a way that it provides the right thermal comfort. If ceiling fan is used with air conditioner at the same temperature then the impact is opposite and the air conditioner uses more electricity. Setting of 26 degrees without ceiling fan will be comfortable as long as one sits closer to the air conditioner. If people are sitting far from the air conditioner, circulating the air using fan makes everyone in the room comfortable as the whole room cools down because of circulation of cold air. 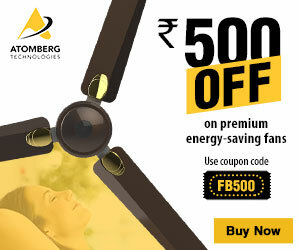 With a ceiling fan, one can feel about 3 to 4 degree centigrade cooler, therefore if it is used along with an air conditioner, the load on the air conditioner can be reduced by keeping it at a higher temperature. In a moderately hot weather, ceiling fans can even allow you to avoid air conditioner all together. Many a times it is comfortable enough to have a bath before sleep and then sleep with just a fan put on. Thus ceiling fans can help significantly in cutting air conditioner load. Also it is important to note that ceiling fans cool people and not the room. So they are not alternative to air conditioners. They just help you to feel cool by evaporating the sweat or water on your body. So keeping a fan on to keep a room cool does not work.